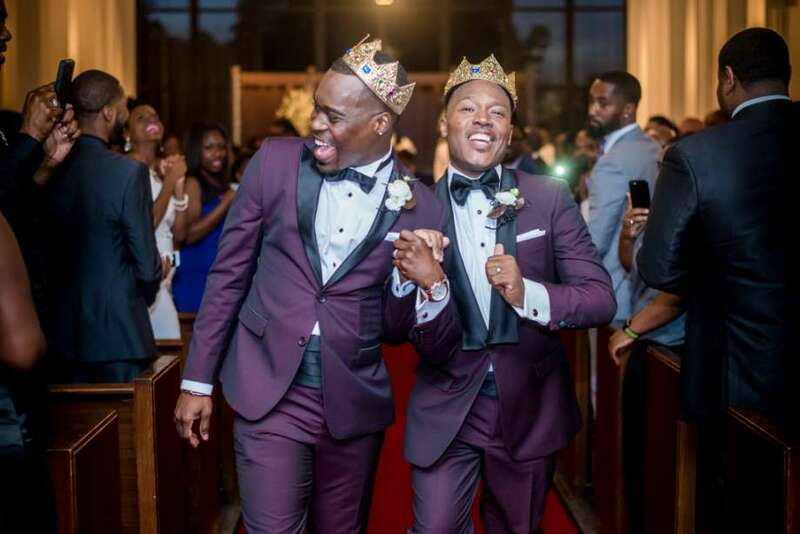 Adrian Homer and Harrison Guy first met ten years when Adrien pledged to join the Delta Phi Upsilon, a fraternity for queer men of color, at Prairie View A&M University near Houston, Texas. Harrison was assigned to be Adrian’s mentor during the pledging process. Adrian was 22 and Harrison was 29. Neither of the guys expected that their fraternity bond would lead to marriage, let alone a romantic partnership. What started as some flirty text messaging quickly turned into something more. Adrian admits that there are some members of their fraternity who feel that, even though it’s a gay frat, brothers should not be romantically involved. Earlier this year, after ten years together, Adrian and Harrison finally exchanged vows before 275 friends and family members, including several of their Delta Phi Upsilon bothers. The wedding included a total of 19 groomsmen and groomsmaids and an extravagant “coronation of love” that involved each of the grooms crowning the other. They also held a tribute to their friend Chyna Gibson, a trans woman who was killed in New Orleans earlier this year.